A unique cobweb lace bridal shawl which can be used as a veil, and then as a baby shawl or worn as a wrap, re-awakening memories each time it is used. 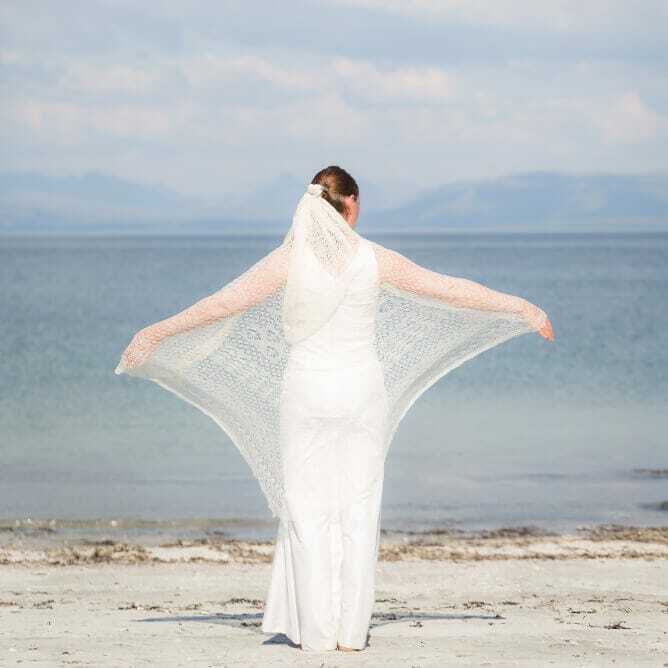 A unique cobweb lace bridal shawl which can be used as a veil, and then used after the wedding as a baby shawl or worn as a wrap, reawakening memories of the special day each time it is used, and potentially becoming a family heirloom. It can be all one colour or have a border in the colours of the wedding or a tartan to reflect the groom’s kilt. Perfect for ensuring a sleeveless wedding dress won’t leave the bride shivering. A unique, bespoke bridal shawl hand knitted in cobweb lace from hand-spun cobweb yarn, blended from wool and silk. It is very light but also soft and surprisingly warm should there be a cool breeze. Each piece is handknitted using handspun and dyed yarns, and therefore a one-off. The colours are inspirational only, so please let us know in the comments section at checkout what colour you would like, or email hello@craftdesinghouse.com to discuss. This product is made to order with a typical lead time of 2 months. Jenny is a spinner/knitter and she lives on the Isle of Eigg, Scotland where she spins cobweb yarn which she then knits into unique cobweb shawls, stoles, wraps, scarves and fingerless gloves, etc. For ethical reasons, she uses kid mohair instead of silk which comes from New Forest Mohair and adds a lovely luster to the finished product. Her wool comes from South Yeo Farm East which is a rare breeds farm also with high standards of husbandry. She hand dyes the fleece and kid mohair using natural dyes. She also produces cobweb and lace weight yarn for knitters who enjoy her colours. She grew up in South Africa and first saw examples of cobweb lace in a craft shop in Pitlochry when she was visiting the UK as a tourist in the mid-1970s. She trained as a horticulturist in South Africa and worked there until 1983 when she was accepted as a voluntary student at the Royal Botanic Garden, Edinburgh. Eventually, after living in Europe for a few years with her husband, she ended up on the Isle of Eigg where he was employed as the estate gardener. She went back to South Africa for 10 years in the mid-90s but longed to return to Eigg, so eventually came back with her two dogs in 2009, built her dream home, and began to build a business selling hand knitwear. The business has changed from being very general in product to specialising in the cobweb lace which is her real passion. She decided to try her hand at spinning in 2011 and was lucky enough to get assistance from Creative Scotland to buy a hand-crafted spinning wheel from Rod Grant. That development has made an enormous difference to her products as well as to her enjoyment of her work. She now can blend and spin different types of fleece and colours which means that every article is unique. The natural world around her is the inspiration for her work. The beautiful scenery around her is a constant source of inspiration for her colours, and walks with her dog, Harry, are the times she develops her ideas for new projects. Environmental issues are very important to her, so she tries to source her fleece as locally as possible. Because she spins yarn especially for each piece of work, they are all unique. Feedback from people she has produced bespoke work for has indicated that they really liked the fineness of the work and that the colours complimented what they wanted to wear them with.